In a letter to his daughter, Benjamin Franklin revealed that he wished the Bald Eagle had not been chosen as our national symbol. His reasoning was that its practice of stealing prey from other birds gave it a “bad moral character.” He felt the Bald Eagle was just too lazy to hunt for itself. (see an excerpt of the letter at this link: http://greatseal.com/symbols/turkey.html). Benjamin Franklin wasn’t necessarily wrong. 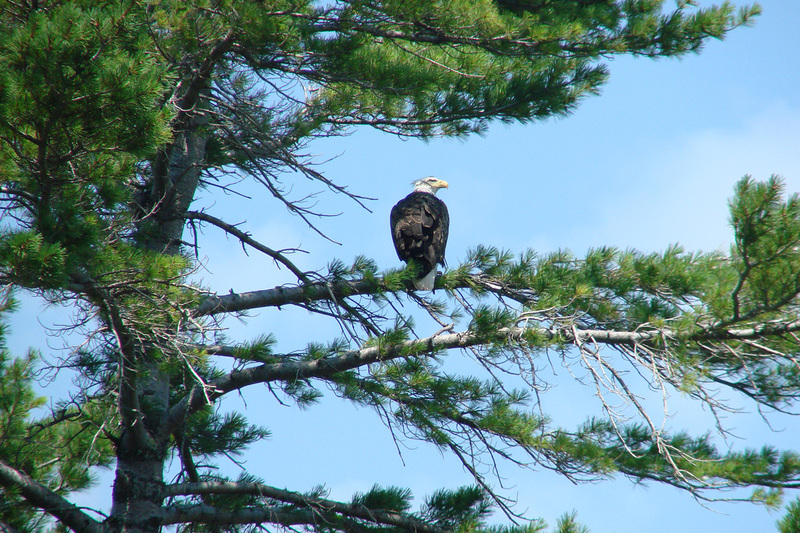 I once observed a Bald Eagle patiently watching a loon from a high perch in a white pine tree. Eventually the loon caught a nice-sized fish. The eagle dive-bombed the loon who was forced to abandon its catch as it dove to safety below the surface of the water. The eagle picked up the catch, returning to the tree for a nice meal of fresh fish. The thief had won. Kleptoparasite is the term for an animal that steals a meal from another animal (the host). This form of hunting is quite common, occurring in nature from mollusks to mammals and at least 197 species of birds. Bald Eagle attempting to pirate a fish from an Osprey on the Peshtigo River at Potato Rapids Dam, Marinette County, Wisconsin, USA. 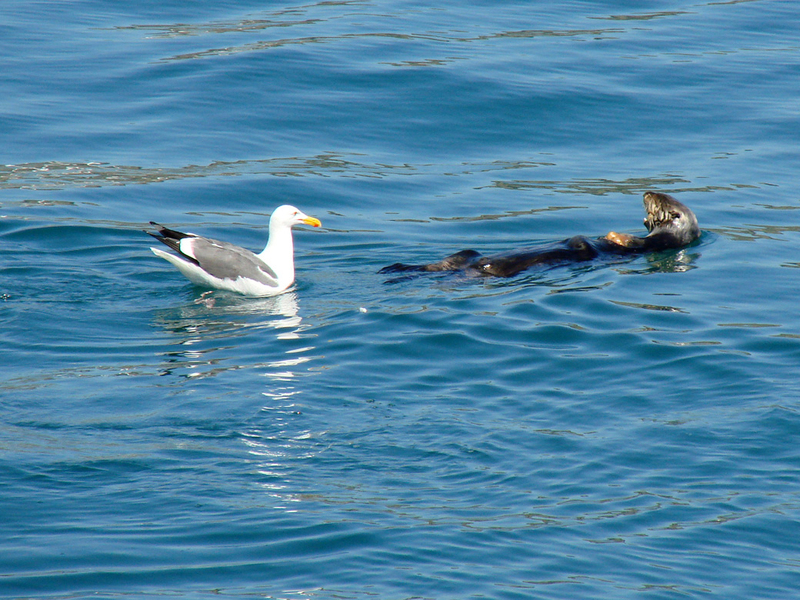 While in California one winter I watched a gull steal a fresh catch from an otter. The otter dove down and came up with a mollusk. Rolling over, it placed the mollusk on its chest as an interested gull swam nearby. 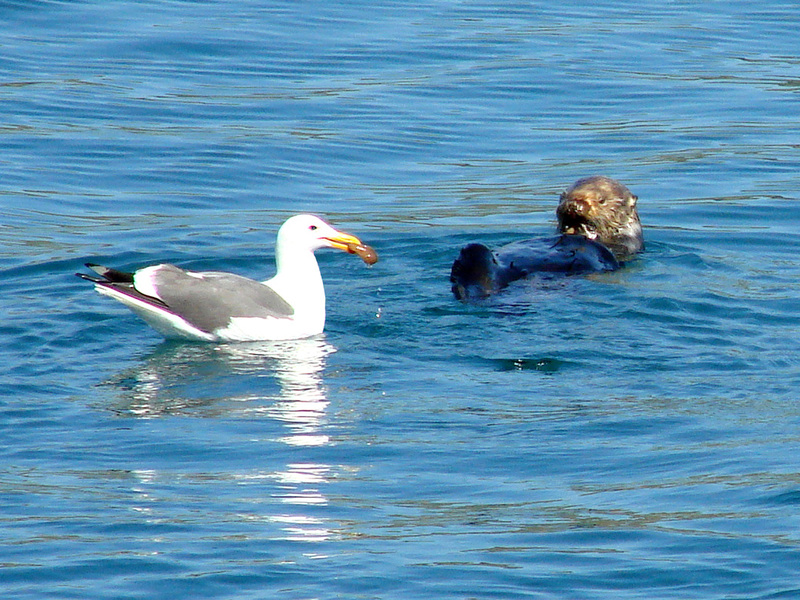 Before the otter began to enjoy its meal, the gull swooped in and stole the mollusk for itself. Peregrine Falcons and Red-tailed Hawks are also well-known pirates. Red-tails commonly steal from Rough-legged Hawks, Northern Harriers, and sometimes Ferruginous Hawks. They may harass a hawk while in flight until the host drops its prey. The Red-tail will then either capture the prey item in mid-air or pounce on it as it hits the ground. 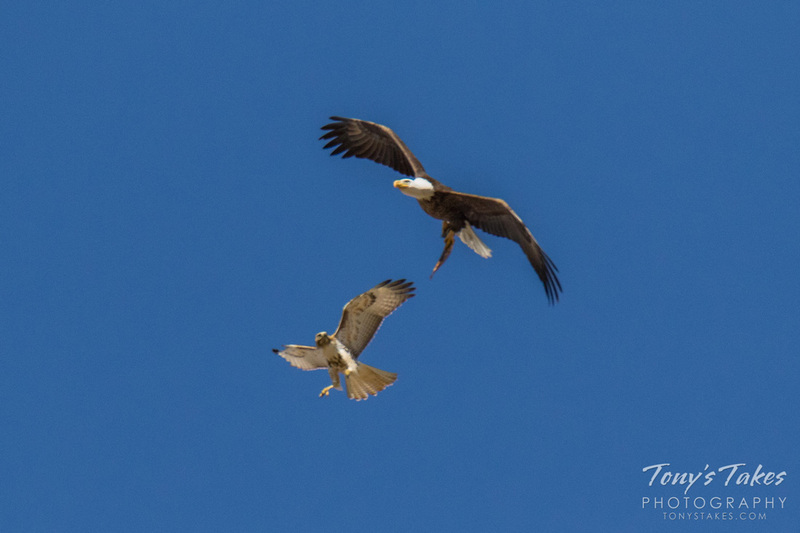 In addition to a mid-air challenge, Red-tailed Hawks may confront another raptor on the ground. Red-tailed Hawks may become hosts themselves. Golden Eagles will pirate from Red-tails as well as Bald Eagles, Ferruginous Hawks, Rough-legged Hawks, and other birds. This Red-tail has a really big idea as it eyes fish from an uncommon, but potential eagle host. Peregrine Falcons will stoop (dive) toward a bird that possesses a fresh prey item in an attempt to force the host to drop the prey. Like the Red-tailed Hawk, the falcon will seize the prey as it falls or pounce on it as it hits the ground. Peregrines also use a method called crabbing. The Peregrine will fly under the host bird, roll over, and try to grab and pull the prey away from the host. Although a Peregrine’s favorite prey is typically other birds, they will also eat mammals and fish, which are often pirated from other birds. In Yellowstone National Park along the canyon area of the Yellowstone River, fish remains have been found in Peregrine nests. 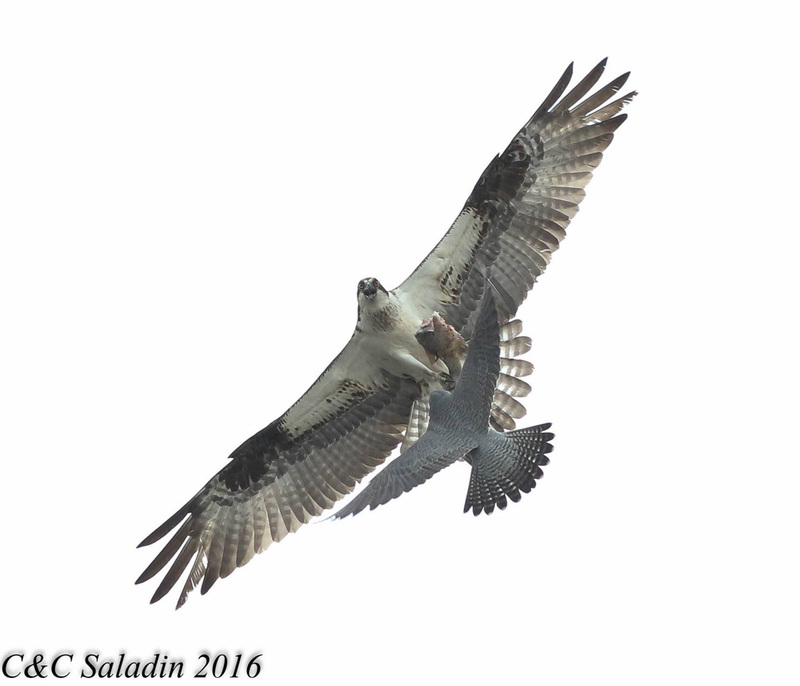 They aren’t carrion eaters, nor fisherman, so the most likely explanation is kleptoparasitism from Osprey. 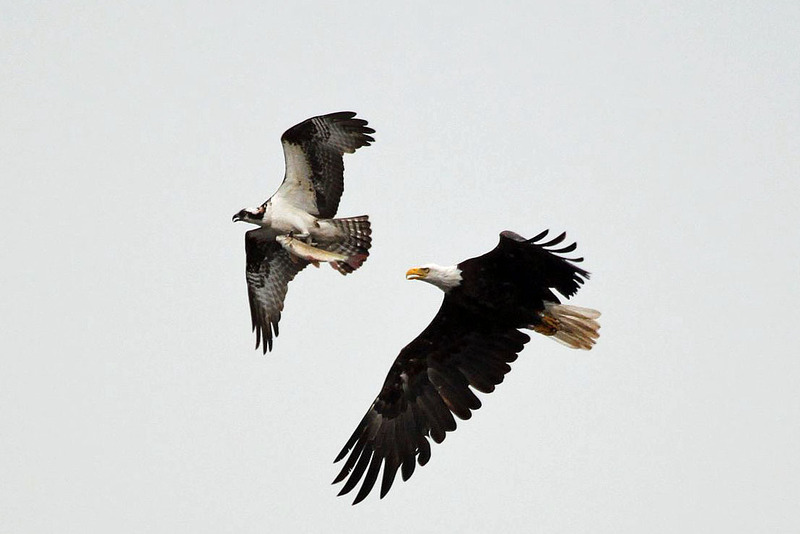 Peregrine Falcon using the crabbing method while attempting to steal a meal from an Osprey. Laughing Gulls pirate fish from pelicans by hovering over them and pecking at the pelican’s outstretched bill as they try to swallow their catch. An African bird, the Fork-tailed Drongo, has developed a different method for stealing larger prey from ground-foraging Pied Babbles. 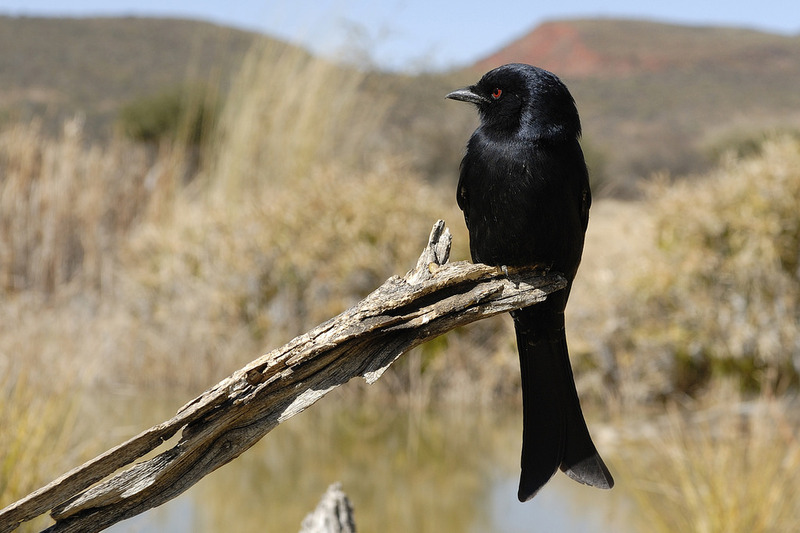 Drongos have learned to imitate the alarm call Babbles use to warn others of danger. At times a Drongo will call out its fake alarm. The Drongo then swoops in and grabs up what ever the startled Babbles drop as they run for cover. Eventually, many of the adult Pied Babbles figure out the deception. Recently a study in Behavioral Ecology and Sociobiology has found that Dragos have learned which birds are the easiest to deceive. The Drogos more often use their fake alarm on juveniles, which are more easily tricked than the adults. When self-foraging, Drongos dine on small insects such as flies, termites, and ants. As kleptoparasites, they can obtain prey such as lizards, scorpions, and other larger items – a much better payoff. Kleptoparasitism seems like an easy, and as Mr. Franklin would say, lazy way to obtain food. Yet many species of birds are not pirates. So why don’t all meat eating birds practice this? According to a review of Animal Behavior, brain size to body size was a better predictor of piracy than the size of a bird. Kleptoparasitism seems to require more intelligence than other methods of obtaining prey. 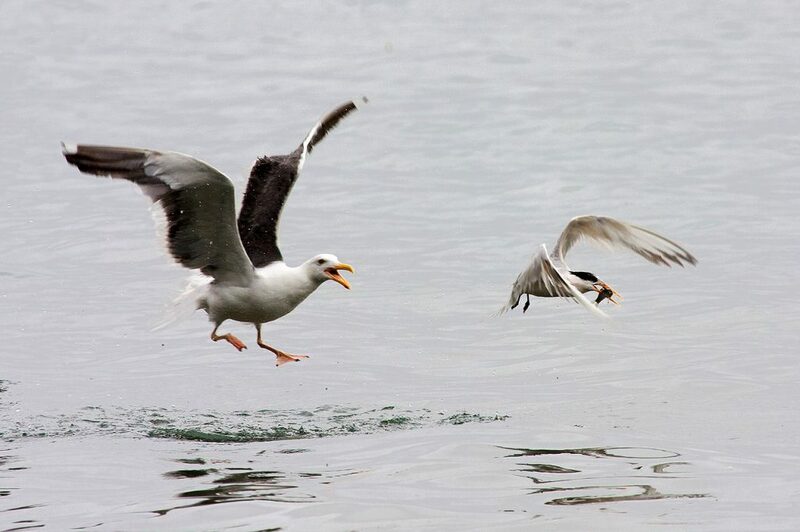 Western Seagull hoping to pirate a small fish from an Elegant Tern. Although the seagull is larger, studies show it is brains that count more than braun. 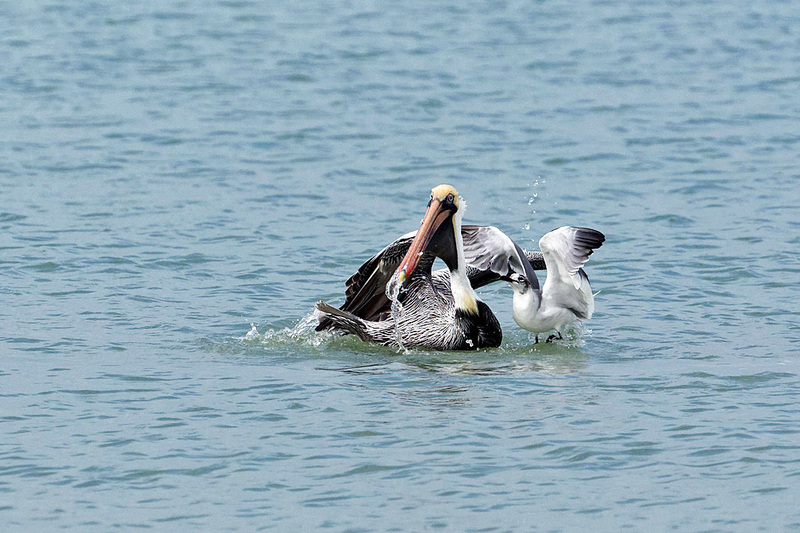 Tern and Brown Pelican by Kimon Berlin, Attribution-ShareAlike 2.0 Generic license, https://www.flickr.com/photos/kimon/8414930191/in/photostream/ This license allowed for editing. I have lightened, added contrast, sharpened, and enhanced the color of this photo.